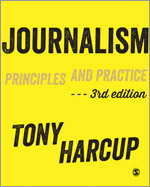 A third edition of Tony Harcup’s Journalism: Principles & Practice allows students free access to an interactive eBook. The latest version of the highly successful journalism text, which was described by Times Higher as ‘the bible of professional education in journalism’, includes video tutorials presented by the author. It is also fully updated to represent the latest trends in social media, the impact of Twitter, and the need for an ethical approach. Published by SAGE, it retains its characteristic two-column structure which blends theory and practice.